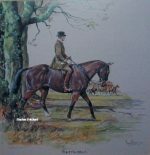 From his early days, wild animals and their haunts were his absorbing preoccupations and, when he reached the stage of having a pony of his own, hounds and hunting became the very breath of life. He started drawing animals at the age of 4 and even completed two illustrated storybooks at the same time, though it was not until he was 26 that his first book was published. 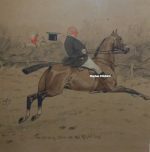 In sporting pictures, the matter of “rightness” is of great importance and it is interesting to note that Lyne actually hunted a pack of beagles for a number of years, giving him that accurate sense of detail so well depicted in his work. Michael Lyne died in 1989.